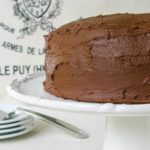 A recipe for a chocolate layer cake with moist chocolate layers and a creamy chocolate frosting. Preheat the oven to 350 degrees F. Grease two 9-inch cake pans. Line the bottom of the pans with parchment paper. Grease the parchment paper and then flour the pans. In a large bowl, add sugar, flour, cocoa, baking powder, baking soda, and salt. Whisk to combine. Add the eggs, buttermilk, oil, and vanilla. Beat on medium speed of an electric mixer for 2 minutes. Stir in hot coffee and boiling water. The batter will be thin. Pour batter evenly into prepared pans. Bake for 30 to 35 minutes or until a toothpick or cake tester inserted in the center comes out clean. Cool cakes in the pans for 10 minutes. Remove cakes from pans and cool completely on wire racks. In a medium saucepan, add the butter, cocoa, and milk. Cook over low heat until butter melts, stirring constantly. Remove pan from heat. Add salt, vanilla, and powdered sugar to the pan. Beat on high speed of an electric mixer until of spreading consistency. (Frosting will thicken as it cools). Add additional warm milk if necessary. Spread frosting on top of each layer and on the sides of the cake. Slice and enjoy! You may have extra frosting as this recipe makes a big batch. Store any leftover frosting in the refrigerate for up to 1 week. Bring frosting to room temperature to use.